I've never actually attacked a printed piece with Brasso before but I suspect the Minecraft heads will be my first victims as they're rather fun. They are based on perfect cubes, which of course the LEGO® System is not. So how will they fit into the System, if at all? 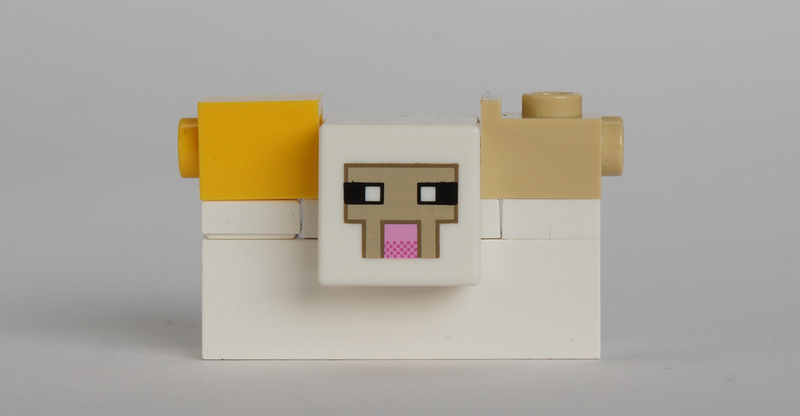 There are two kinds of heads provided; animal heads and minifigure heads. 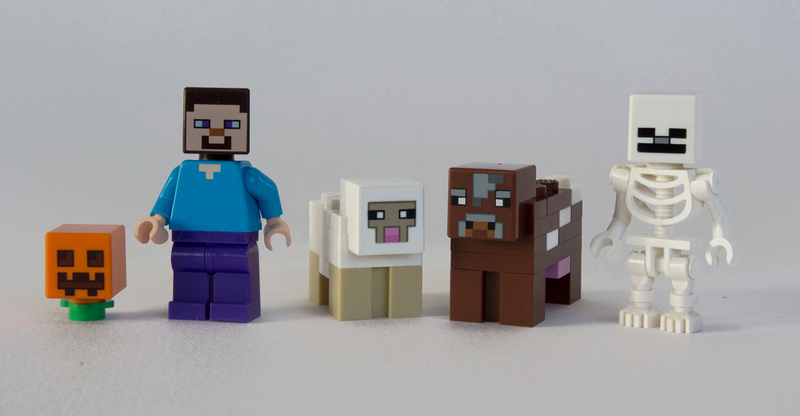 Both are new parts of course, and in this set you get several of each: for animals there's a Reddish Brown cow (Element ID 6103105 Design ID 20056) and a White sheep (6103114 20061) and for minifigs there's a Dark Brown human called Steve (6103062 20044), a White skeleton (6103084 20047) and a Bright Orange [TLG]/Orange [BL] pumpkin (6103099 20054). Let's take a look at the two types in closer detail. My first feeling when I got the animal heads in my hands was disappointment. From seeing them on the box art I'd assumed they were just L-shaped cubes that attached to a jumper plate, but in fact it's all one piece: a modified 1X2 plate. This makes them far less flexible for building purposes, but I can see how it is much less confusing for kids. The designers having "anchored" them to a plate clearly establishes (and indeed forces) how they should be used within the System. And where is that exactly? They're a little narrower than two studs, but how much less? You can see from the yellow brick here that the distance is the same as the difference between the height and the width of a 1X1 brick (for those of you familiar with LDraw units, that's 4 LDU). I've also shown a tan Erling brick here too as of course that brick's geometry also takes advantage of the special "4 LDU" distance. So in fact the animal heads are very much "in System". The base of the cube is one plate lower than the base of the plate section. The top of the cube is one brick higher than the base of the plate. Another part that involves 4 LDU widths are panels, and so a 1X1X1 corner panel fits very neatly around a corner of an animal head. You can see here how I've encased the animal's head in panels and plates. That's of no real use, but it's neat! But using the panels can create a variety of subtle effects in combination with the animal heads. 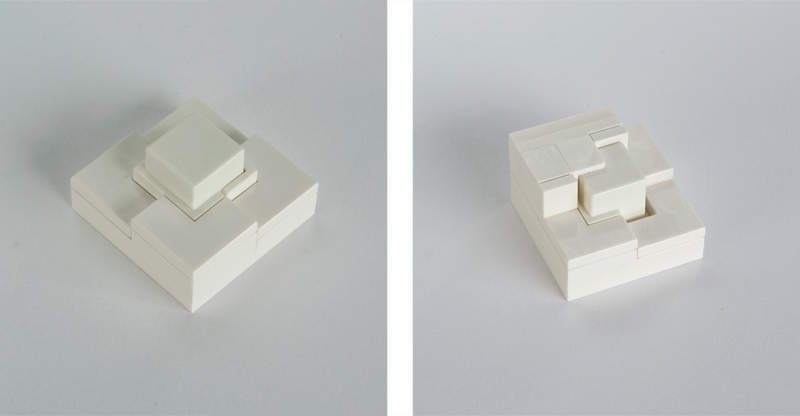 My microscale architecture head is buzzing. 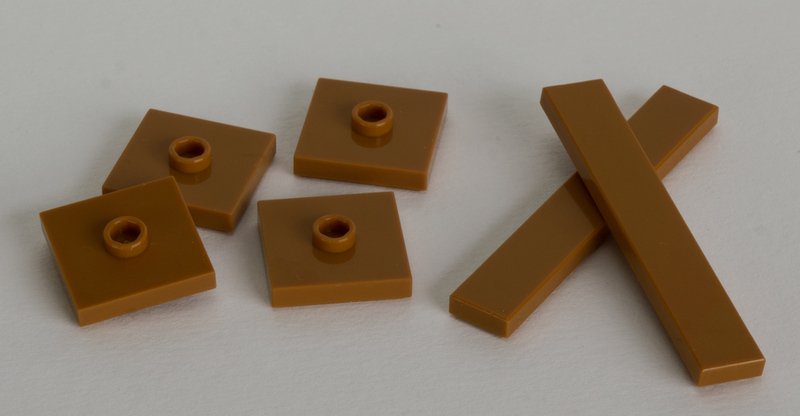 The minifig heads are far less interesting. Their cube is actually slightly smaller than the animal heads' cube, and is not in System. 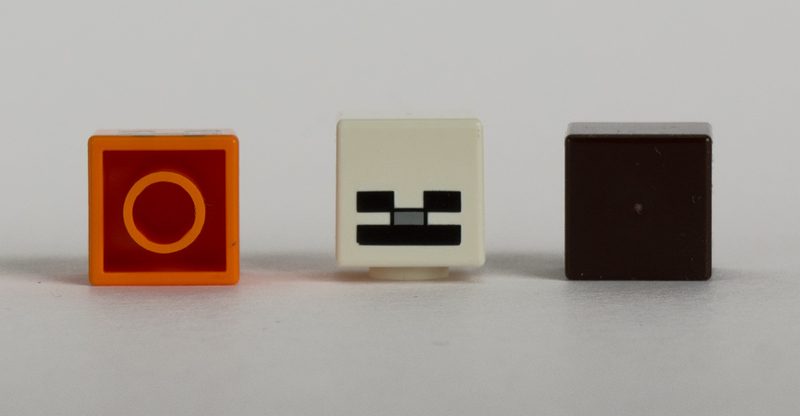 TLG allow far more flexibility with the rules of System when it comes to minifig heads and accessories, so I guess the designers felt these slightly smaller cubes fitted the minifig proportions much better. It's irritating though! From top to bottom the minifig heads are ever-so-slightly more than 5 plates high, and the distance between the base of the cube and the base of the tube that fits on a neck is less than the height of a stud. So really the only alternative use for this part is to place it on a lone stud (like on a 2X2 jumper plate or the side of a 1X1 SNOT brick). Which is still neat, but purely decorative. One of the first things I noticed in the box pictures is that there's a lot of Medium Nougat [TLG]/Medium Dark Flesh [BL] provided; still quite a new and uncommon colour. As Tim G mentioned, there's a Medium Nougat treasure chest for the first time (base: Element ID 6102984 Design ID 4738, lid 6102983 4739) but there are also far more basic parts for me to be excited by. The 2X2 jumper is new to Medium Nougat (6102994 87580) and there are four provided. These also appear in two other Minecraft sets. 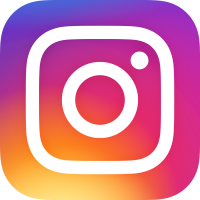 Also new is the 1X6 tile (6102995 6636) of which are are two. 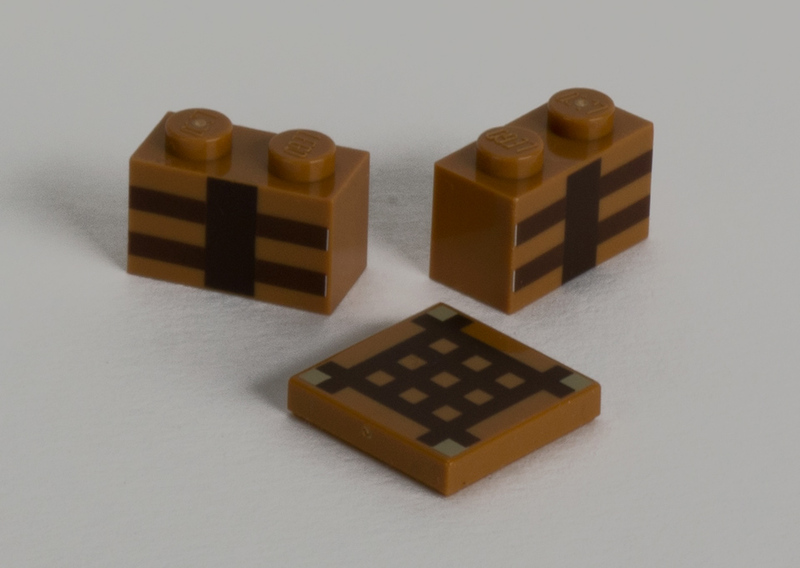 Not new, but each only appearing in one other set, are the 2X2 brick (6058085 3003) and 1X4 tile (6102998 2431). 2X2 tiles have never been released in Medium Nougat but here we get a solitary printed one (6097003 19177) and there are also two 1X2 bricks with printing (6097024 19178). These all go together to create what I believe is an essential part of the game; a "crafting table". But hey, I don't care. What I care about is that these are both beautifully simple geometric designs that could have all sorts of uses in your MOCs, especially when used in repetition. The printing could be interpreted in many ways depending how you utilise the parts but my immediate thought was that the tile would make a great floor pattern or a lid for a basket, whilst the 1X2 bricks could be good for the walls of a medieval house. 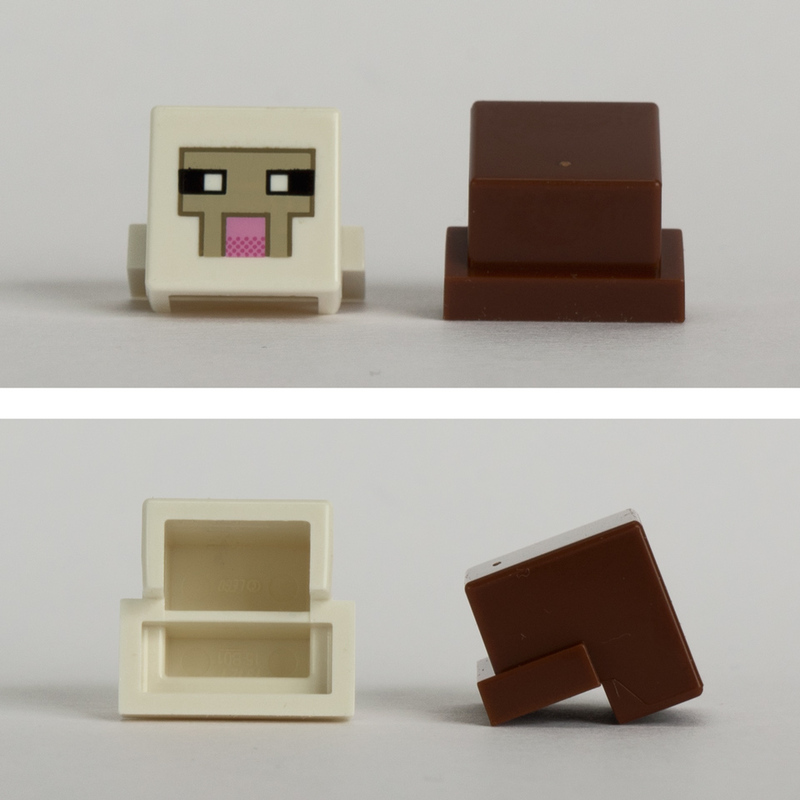 Sadly, I can imagine the popularity of Minecraft causing a high price for these lovely parts on the secondary market. Some of the new elements in the set really surprised me; at first I assumed these must have been available in these colours before - but no. Best of all are the 1X2 bricks with vertical groove. These were introduced in 1981 to allow garage roller doors to slide along the grooves, but I suspect they get much more use as decorative bricks. Here they represent the legs of the animals, and for the first time you get them in Tan (6103001 4216) and Reddish Brown (6103004 4216); two of each. Also new in Reddish Brown is the 1X2 plate with a bar handle on the short side (6102975 60478); again very useful and you get two. Worth noting also is that the latest style of jumper plate now comes in Reddish Brown (6092590 15573). These were spotted in the October Monthly Mini build in LEGO Brand Stores but this seems to be the first set they come in, and you get four. 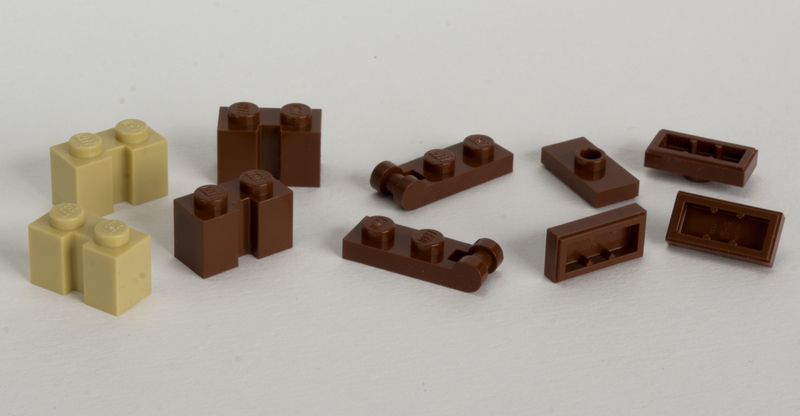 All these basic Reddish Brown parts appearing right now is fantastic timing for me, as I'm completing my first ever largely-Reddish-Brown MOC! Another very cool recoloured part is the carrot top in Flame Yellowish Orange [TLG]/Bright Light Orange [BL] (6096682 33183). I can't think of a single use for it, but I'm sure someone will! 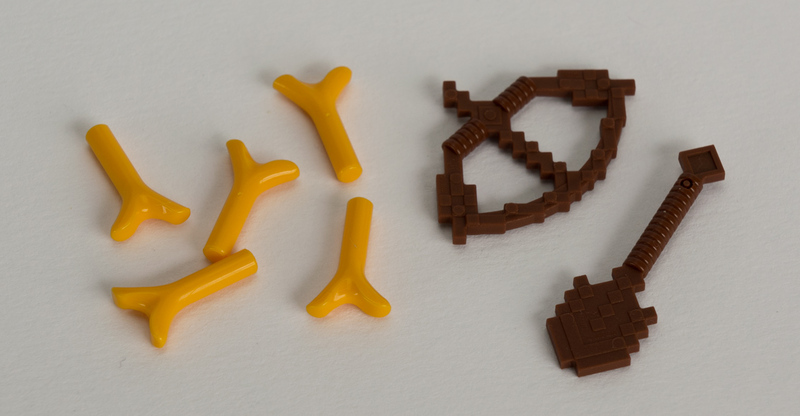 I really like the Minecraft-styled accessories that come in these sets; in this one you get a Reddish Brown bow (6089103 18792) and spade (6093630 18791). Strange as the pixelated effect of them is, I think both these parts could find other purposes. I'd like to try using four of the bows to make a round window frame, but it would be tricky (and possibly ugly). Multiple spades could also be put to interesting decorative uses, or a single one could double as a pair of bellows by a fireplace. I'm not one to discuss the box and instructions normally, but there are interesting things to note here. With the set having a total lack of typical play functions (like flick fire missiles and spring loaded shooters and laser death rays) the rear of the box looks more like "Friends meets Pirates", highlighting as it does such pastimes as digging up carrots, opening a treasure chest and putting animals back in their pen. Oh, and turning your head into a pumpkin to chase a skeleton. Both the front and back of the box are emblazoned with the legend "Build your own creations" - there's even an alternate model pictured on the back - which is all nice to see, but ironic that it's a partnership with a digital competitor that has seems to have reminded everyone of the raison d'être of LEGO. The strangest thing about the box is that the age mark is 8+; I've built 5+ sets that were more difficult than this. Perhaps the choice of saying 8+ is more to do with the target age range of Minecraft; 8 year-olds who think Minecraft is the coolest thing ever would not be so pleased to receive a LEGO set aimed at 5 year-olds. Now, I shouldn't have been so sarcastic about the build complexity because I actually made a mistake almost immediately! The posts of the fence are offset, by being placed in between studs, which I completely failed to notice even though they went to the trouble of adding a big red arrow pointing it out. Ashamed as I felt, it all added to the 'old skool' feel of this build. There are a lot of large plates included given the small size of the set, and it's kinda fun to be adding 2x bricks underneath these and locking them all together. There's one SNOT moment - some brackets for the tree - but let's face it, this isn't about an intricate build experience. Minecraft is about rapid building, smashing apart and rebuilding blocks of stuff. Hence, once the build is complete there are a further 8 pages of "rebuild inspiration", 3 pages of which are given to over showing which small sections of the model you need to pull apart first. In other words, there's not much inspiration supplied. But I guess kids who know the game will be brimming with inspiration as to how things can be rebuilt to mimic the game. 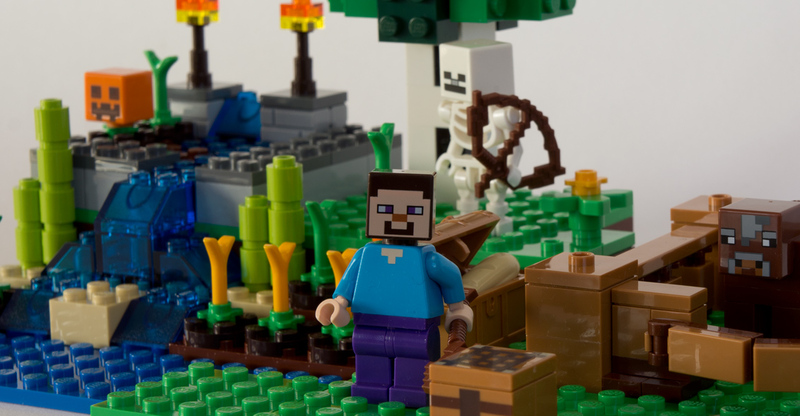 I'm not qualified to comment how effectively this set replicates the Minecraft experience, and if like me you do not play the game then you'll not be buying this for the build or play experience. I'm very happy to have the set though; it's great having these strange new cube pieces to play with and the quantity of Medium Nougat is very welcome. Sure, many parts are very basic but is that so much of a problem? Large plates and 2x bricks are really useful. 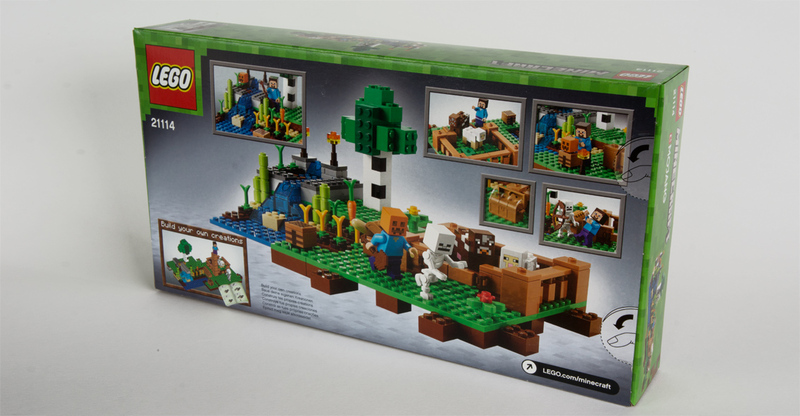 It all comes down to the price I guess, and of course The Farm has a very hefty price tag if you compare it to basic sets like the Bricks & More theme. I think parents will be drawn to the creativity the sets advertise and the apparent return to 'old skool' LEGO. 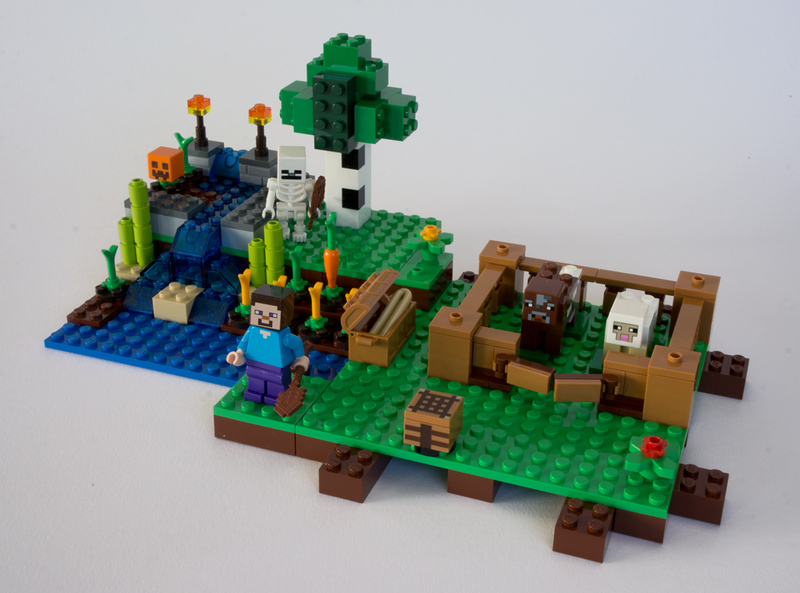 And of course Minecraft-loving kids will be thrilled to receive them. How truly creative are these sets though? I'd love to see how kids play with them, especially in the long term. I suspect that they will build alternate models of their own design - more so than with other LEGO themes anyway - and will be more prepared to mix in their other pieces to create larger models. But at the end of the day, will it be as satisfying - or as easy - as building in Minecraft? Our thanks to LEGO's Community & Events Engagement Team for providing this set. 21114 The Farm is now available in Europe priced £24.99 / €29.99 and from 15 November in North America. The animal head geometry is interesting, that's something that might prove useful one day. I had similar feelings about the 'alternative build' legend on the set I reveiwed; it was nice to see but practically not what us old timers remember from sets in the 80's and 90's. I don't like this one's part selection quite as much as The Cave-- you just can't beat the black pneumatic T. The problem with new colors is that they don't match the old ones we have so much of, so I've got nothing on that medium nougat. Animal heads are blah, regular heads are useless, and I just don't know what to do with much of the new stuff. Basic bricks are pretty useful, I guess, but $30 is too much. So I'm going to pass on this one. What do you mean by new colours not matching old colours? Oh i get you. Chicken and egg situation. 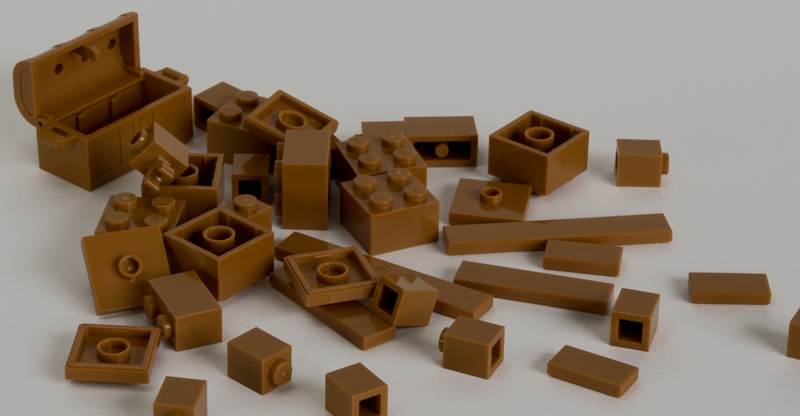 I like to think this is a reason why the Creator designers use unusual colours for Modulars, so we have a chance for a decent amount of basic brick. Yeah, quite scary when you put it like that. The Farm has more of the new custom moulds and large plates, which partly explains it, but... yeah. Definitely is interesting. 21113 and 21115 are the only 2 sets that come in under 10c per brick. 21114 is the most expensive one going by price per brick with 21113 being the cheapest. The rest are just a little over 10c a brick, probably almost the same. It is ridiculous that they are charging 10 euro more for so few extra pieces, even for large plates and new molds. I wouldn't consider either price unreasonable. Maybe they're overcharging for 21114, or maybe they're undercharging for 21113. Maybe they're doing both — it seems plausible that 25 dollars/euros would be a fair price for either of the two sets, but diversifying the price points might be better for overall profits. As it stands, one set is eight cents per piece, the other is around eleven and a half cents per piece. Put them together and you're still getting more than the 500 bricks you'd expect for $50, which hits that ten cent per piece "sweet spot" a lot of people in the AFOL community seem to have agreed on. For what it's worth, 21113 doesn't have any plates as big as the two 8x16 plates and 16x16 plate in 21114, and it also has fewer new molds and unique decorated elements. So that might have factored into the LEGO Group's decision to charge considerably more for 21114. As it happens I picked up 21113 and 21114 last week and both sets are cool. of the 2, the farm is the better or rather more stable set because of the way the cave hangs together - if it's not on a flat surface it tends to fall to pieces easily. And yes, the plates probably add to the cost - 16x16 plates are about 3 euro from PAB website, and with the 2 8x16 plates, that probably is a good portion of the price difference. They do have all that cool trans blue bricks and the slopes in 21114 the farm as well. When you actually look it like that, it is actually a lot more reasonable. Yes, I love MineCraft. I will be doing my best to get them all - it's so hard though, an xbox one to play a bigger better Minecraft or Minecraft Lego which like both Lego and minecraft - can't decide....aaargh. I agree with Aanchir; buying both sets together gives you a cost-per-piece of under $10. But I think the Farm has enough new, rare, useful pieces to justify its higher price point. That's actually the one I would prefer to get. The animal heads, yellow carrot stems, shovel, bow, and all that dark nougat are too good to pass up.